CDE plants at QPMC ... supplying approximately 33,000 tonnes of washed sand every day. CDE Global says it has reinforced its position as the leading washing equipment provider in the Middle East with current installations totalling a capacity of more than 10,000 tonnes per hour (tph) of sand across the region. In recent years, CDE equipment has sprung up across the Middle East, handling a wide range of applications and capacities, and today CDE boasts an extensive portfolio of projects in the Gulf region. These are a mix of plants which include equipment from the CDE core product range as well as specialised turnkey processing systems for large companies with centralised operations. The CDE M-Series integrated mobile washing equipment is an important piece of equipment in the Gulf delivering enhanced product quality and operational efficiencies, and is the most advanced sand washing system available in the region, explains CDE Global brand manager Sorcha Simpson. Khaled Nasr, deputy manager of sand washing and infra works at Associated Construction Company (Asco) in Kuwait explains the reasons behind his company’s choice of the series. “We looked at all the options available and our purchase of the M2500 demonstrates the focus on quality and efficiency that has allowed Asco to improve on its delivery of high quality washed sand to the construction industry,” he says. “This addition to our processing capability will ensure that the sand products we offer are of the highest quality available in Kuwait. The M-Series offers feeding, screening, sand washing and stockpiling on a compact, portable chassis and can process a range of materials including sand and gravel, crushed rock, construction and demolition waste recycling, scalpings and mineral ores like iron ore. 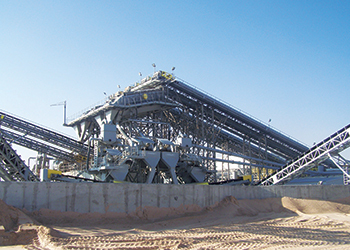 In Qatar, CDE installed the world’s largest sand washing plant with a capacity of 1,200 tph for the Qatar Primary Materials Company (QPMC) in Doha in 2009. Today, these plants are supplying approximately 33,000 tonnes of washed sand every day, Simpson says. In Saudi Arabia, CDE installations and applications range from processing construction sand and aggregates for concrete to processing silica sands across the Eastern and Western provinces. These systems include both wet processing equipment with CDE hydrocyclone technology, and dry sand processing systems with the CDE Sirocco air classifier. The EvoWash fines washing plant uses hydrocyclone technology to offer unrivalled control of silt cut points and produces the desired sand specification in each project. “The EvoWash operates efficiently and has had a positive effect on the quality of our concrete products,” says Tariq Abdullah Abdein, general manager of Abdullah Abdein, Saudi Arabia, where a 150-tph sand washing system is currently operational. Air classifiers offer an efficient dry classification system for removing excess fines from crushed rock, to facilitate the production of high quality sand products for use in construction. “The results from the Sirocco are very good – it is like washing without the water,” comments Mohammed Alamin, batch plant manager at JPC ReadyMix, Makkah, Saudi Arabia. The Sirocco is available in a range of capacities and current installations are processing over 400 tph of -6-mm high-quality sand in Saudi Arabia. The success of CDE in the Western Province can be attributed to Medco – Jeddah. Medco is a leading dealer of premium industrial and construction equipment in Saudi Arabia. It provides an on-going relationship with customers following the sale and commissioning of a CDE plant, including service and spares, to ensure optimum performance is maintained for maximum productivity and efficiency. In Kuwait, most of the washed sand available is processed through CDE equipment. Most clients chose to have an integrated approach to their plants with CDE M-Series equipment, alongside an AquaCycle thickener. The introduction of the AquaCycle system reduces the volume of fresh water required to feed a washing plant by more than 80 per cent which brings significant cost savings and also reduces the area previously required to accommodate ponds or lagoons. “The AquaCycle allows us to reduce the environmental impact of our operations by minimising the amount of water required to run the new washing plant,” says Nasr. In Oman and Bahrain, CDE is working with major construction companies and raw material (sand) suppliers in the region. A relationship with Genserv, dealers of premium construction equipment in Oman, has proved fruitful for CDE. Clients are utilising customised CDE sand washing systems for processing low quality sands with high silt content to produce construction grade sands. The flexibility that CDE can offer and the ability to customise systems based on customer’s requirement has been key to its success in the region, Simpson concludes.